Although Bisbee is the Cochise County seat, Sierra Vista is by some distance the largest city in the county, partly due to troops stationed at the huge Fort Huachuca Military Reservation, which occupies over 100 square miles to the west, at the foot of the Huachuca Mountains. Stores, restaurants, hotels and other businesses in town are concentrated along two roads, east-west Fry Blvd and north-south Hwy 92, with the main shopping center (Mall at Sierra Vista) towards the south. The remainder of the city is residential, but quite dispersed, with many patches of as yet undeveloped land between the backstreets and housing estates. 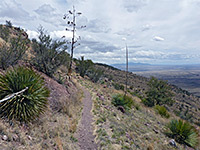 Nearby attractions include Bisbee (24 miles), Coronado National Memorial (21 miles), Patagonia Lake State Park (55 miles) and Tombstone (18 miles). Hampton Inn Sierra Vista is a well regarded, recently built hotel, located towards the south side of town just off Hwy 92 - 4 miles from Fort Huachuca and one mile from Mall at Sierra Vista. Many of the 58 elegant guest rooms enjoy sweeping views westwards across town to the Huachuca Mountains, location of Coronado National Memorial. Hotel attractions include free hot breakfast (take-out version available), free evening manager's reception (Mon, Tue, Wed), a business center, meeting room and an indoor pool. One of several new hotels in Sierra Vista, AZ, the Holiday Inn Express along Highway 92 (west side), has a good location next to the Sears/Dillard's mall at the southwest corner of Sierra Vista, close to the start of the desert that stretches southwards to the Mexican border and beyond. The hotel accommodates guests in 77 clean, extra large rooms & suites (all containing a microwave/refrigerator), and has facilities of an outdoor pool, whirlpool, bbq grills, guest laundry, business center and five meeting rooms. Complimentary hot breakfast buffet is served. 71 spacious, modern suites are on offer at the Candlewood Suites Sierra Vista, a new hotel towards the south side of town along Highway 92, within half an hour's drive of many interesting sites including Tombstone, Bisbee, Kartchner Caverns and the Coronado National Memorial. The rooms contain a full kitchen, extra sofa bed, and DVD players - discs are available free of charge from the hotel's movie & music libraries. Food and snacks can be purchased from the on-site convenience store; the other main facilities are a fitness center, outdoor pool, hot tub and guest laundry. Best Western Plus Sun Canyon is a newly constructed hotel, open early 2019, at the intersection of Fry Boulevard with Buffalo Soldier Trail, right opposite the entrance to Fort Huachuca. There are plenty of restaurants within walking distance, and a supermarket. Most guest rooms enjoy mountain views, and all are equipped with a microwave & refrigerator; some feature a balcony and/or kitchenette. Daily hot breakfast and evening receptions (Mon-Thu) are complimentary. A convenience store sells drinks and snacks, while a firepit and bbq grill provide an alternative to in-room cooking. The hotel also has a fitness center and an outdoor pool. In the expanding suburbs of south Sierra Vista, Fairfield Inn & Suites is a clean, new hotel built next to a large shopping mall with several restaurants, alongside Highway 92 - one of the closest hotels to the Coronado National Memorial (16 miles south). Fort Huachuca lies a few miles west, and the Pueblo del Sol Country Club is just down the road. The 160 room hotel features a heated outdoor pool, free continental breakfast, fitness room and guest laundry. On Fry Boulevard near the center of Sierra Vista, the Comfort Inn & Suites is a well reviewed hotel, receiving favorable comments for the clean rooms, good customer service and the above average free breakfast, which includes a few hot items. The three floor inn has a new, interior corridor design with an outdoor pool at one side and a few fast food restaurants nearby; for other shopping the main sites are 2 miles south along Highway 92. All 65 rooms contain a microwave, refrigerator and coffee maker. Quality Inn Sierra Vista occupies an older, interior corridor building adjacent to a Japanese restaurant, which shields the property from the main road (Hwy 92). All 103 rooms contain a microwave & refrigerator, and have views either of the spacious parking lot or the outdoor pool/hot tub, on the south side. This location is half a mile from Mall at Sierra Vista, and close to many other restaurants. Complimentary amenities include deluxe continental breakfast, local calls, weekday newspaper and wi-fi. Sierra Vista's Days Inn motel is located on the south side of Fry Boulevard, the main east-west route through the center of town, in a semi rural setting with mostly undeveloped land to the north. The center of Sierra Vista is a mile to the west, while the large Ft Huachuca army base is 3 miles away. The pet friendly hotel has 40 rooms, a seasonally heated outdoor pool with nice views of distant mountains, a 24 hour front desk and a dining area where the free continental breakfast is served. Room rates are relatively cheap. Guests at the pet friendly Rodeway Inn Sierra Vista are within a short walk of many restaurants and other businesses; the inn is situated in a commercial district near the Fry Boulevard/Buffalo Trail intersection, close to the Fort Huachuca entrance. Guest rooms are on two floors of an exterior corridor building, surrounded on three sides by the parking lot. Wi-fi and continental breakfast are provided free of charge. The main leisure amenity is an outdoor pool, at the front of the property shielded by trees from the access road.